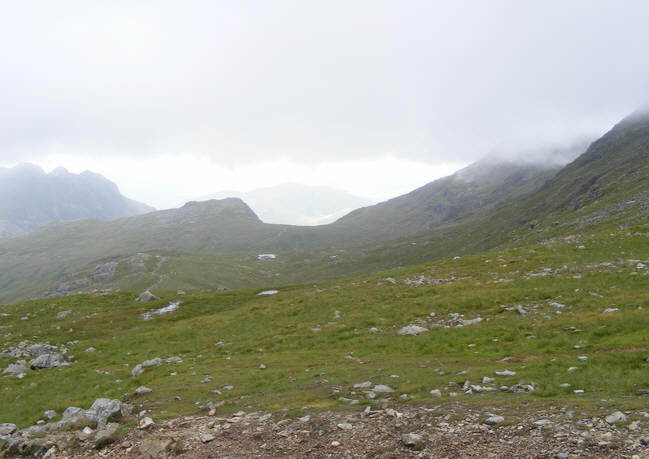 This picture shows the ground crossed on the way from Esk Hause to Great Langdale. Rossett Pike is just left of centre. The path up Rossett Gill starts just to the right of the pike. Pike-o-Stickle can be seen to the left, while Bow Fell disappears into the mist on the right. Just visible in the background is Lingmoor Fell. Angle Tarn is hidden in a dip in the ground in the centre of the picture.